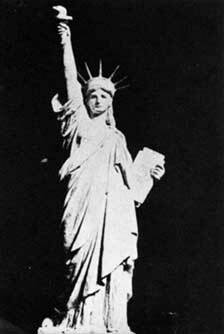 AS SOON AS Bartholdi's plan had been approved by the men who sent him to America, he had started working on the designs of the statue. By the time the Franco-American Union was formed in 1875, he had already made several small study models. 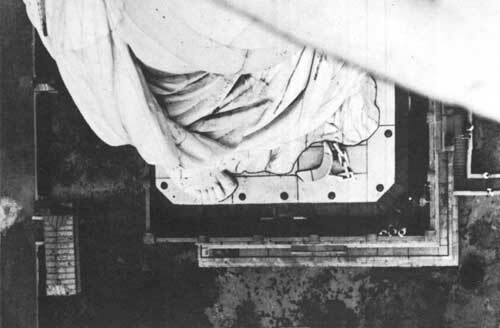 An early study model of the Statue of Liberty, 1875. Display of the many-sized models of the statue in the Bartholdi Museum, Colmar, Alsace. The most difficult problems were involved in the mechanics of construction. In solving them the sculptor had no guide but his own genius. The material for it must be light, easily worked, of good appearance and yet strong enough to stand the stress of a long ocean voyageand must be almost impervious to the effect of the salt-laden air of New York Harbor. Copper was decided upon as the material, to be supported by a framework of iron and steel. 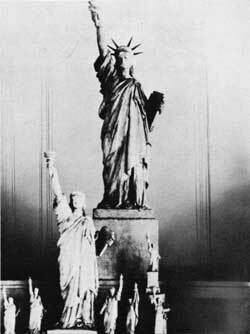 To get the form for the statue, Bartholdi made what is called the study model, measuring 1.25 meters, or about 4 feet in height. This was cast and recast. From this model was reproduced a statue having a height of 2.85 meters. By this method another model four times larger was obtained, giving the figure a height of 11 meters, or 36 feet. This model was corrected down to the most minute detail. Then the statue was divided into a large number of sections, each of which was also to be reproduced four times its size. These reproductions, when joined together, were destined for the colossal statue in its finished form. 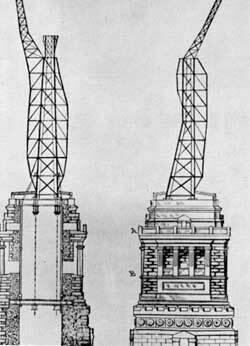 Framework of the statue, designed and executed by Gustave Eiffel. From the "Scientific American," June, 13, 1885. Only a comparatively small portion of such a gigantic statue could be worked on at a time. Section by section, the 36-foot model was enlarged to four times its size. For each section of the enlarged model it was necessary to take about 9,000 separate measurements. When a section was finished, the carpenters made wooden molds. On these molds, copper sheets, 3/32-inch thick, were pressed and hammered into shape. More than 300 separate sheets of copper, each hand-hammered over an individual mold, went into the outside, or envelope, of the statue to form the figure. The framework, too, is worthy of attention. It was designed and executed by the great French engineer, Gustave Eiffel, who afterwards constructed the famous Eiffel Tower in Paris. Four huge iron posts run from the base of the statue to the top, forming a pylon which bears the weight of the whole structure. Out of this central tower is built a maze of smaller beams, each supporting a series of outer copper sheets. Each sheet is backed by an iron strap to give it rigidity. These iron straps are fastened to the supporting framework in such a way that each section is supported independentlyno plate of copper hangs from the one above it or bears upon the one below. In the completed statue the shackle, which Liberty symbolically has broken, lies in front of her right foot, the heel of which is raised as in walking. The shackle chain disappears beneath the draperies and reappears in front of her left foot, the end link modeled to appear broken. Unfortunately, these details are in such a position they cannot be seen by the visitor. The broken shackle which lies at the feet of the statue.